I’ve been craving all week for one of these. 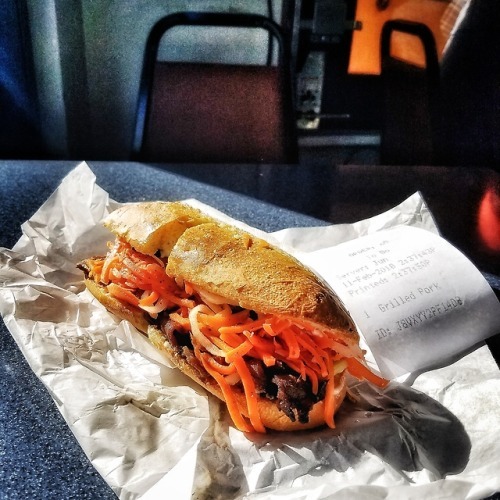 Banh mi… – Photojimsf!!! I’ve been craving all week for one of these. Banh mi sandwiches, a gift from Saigon to the rest of the world, are a fusion of French and Vietnamese cuisines. The French baguette is made lighter, fluffier, with a delicately crunchy crust by using rice flour along with the traditional wheat. The improved product is sliced open and slathered with spiced up mayonnaise sauces. Then it’s stuffed with grilled, fried, or roasted pork, chicken, duck, or beef, pork bellies, cold cuts, liver pate, tofu, fried egg, sometimes all of the above! Pickled shredded carrots and white radishes complement the meats nicely, along with fresh cilantro and jalapeno peppers. So satisfying. This fabulous version is from Dinosaur’s in the SF Castro. Grilled pork. Purple Velvet Eyes Nose Lips. Hair. Beautiful face, good heart….